It's casual and charming. It's glamorous and welcoming. 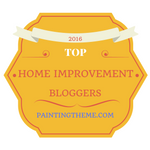 So why don't I recommend shabby chic decorating for staging your home? Because it's also distracting, quirky, uber feminine, and loaded with opportunities for home staging mistakes. 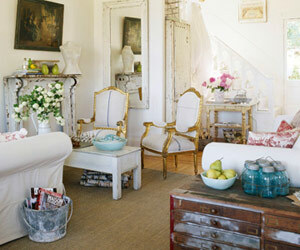 Shabby chic style is characterized by its love affair with almost anything old. It favors layers of obviously faded natural textiles like cottons and linens, distressed furniture finishes, pastel colors, and a combination of elegance and rusticity. Its signature pieces are slipcovered, overstuffed pieces, furniture painted white, and vintage chandeliers. Someone touring these homes with an eye to buying won't know where to look in these rooms. Pretty, yes, but for staging purposes, not so good. There are too many details, too many colors, weak focal point, stuff on the floor, and too much in-your-face rattiness. For the record, and so you won't think I'm a stuffed shirt, I love the shabby chic style. I love its girliness, romanticism, muted colors, thriftiness, its emphasis on furniture with good bones, and its comfort level. All I'm saying is that if you stage your home in this style, you're walking into land-mined territory. So, let's carefully pick and choose what works and what doesn't, so your pretty staging doesn't blow up in your pretty face. This setting is lovely...but crowded, cluttered, and even downright dangerous to be eating food off that old, peeling table. Anyone heard of the dangers of ingesting lead paint? Buyers can't maneuver around this alcove, and they are left with the impression of cramped quarters. Here we've got pillows that are too small, no variety in the scale of textile prints, a scatter rug breaking up the floor's expanse, faces of someone's relatives staring back at you, a day bed that doesn't look all that comfy, and way too many ruffles. All very "grandma." Next! Okay, I'm a housepainter, so that old chipped paint is always going to bother me. It's one of the reasons I couldn't decorate my own home like this. That, and the fact that I wouldn't feel right surrounding Mr. Lucky with so much feminine stuff. 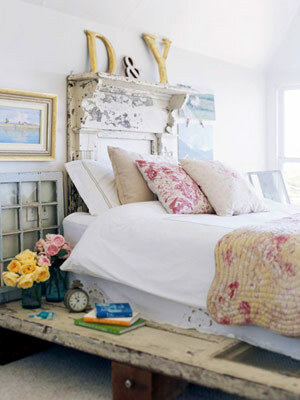 Staging-wise, this bedroom looks like a garage sale. 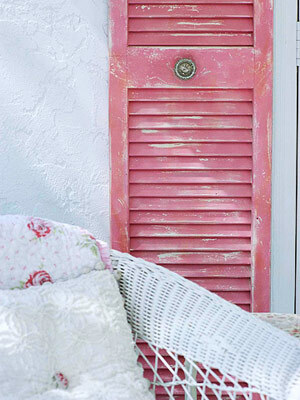 There's a reason why shabby chic is known as "salvage chic." I'm all for re-purposing, but a mantel headboard, a window for wainscoting, a door for a bed, and dresser drawers to elevate it, is too much of a good thing. Old needs new next to it to do it justice. Buyers like new. 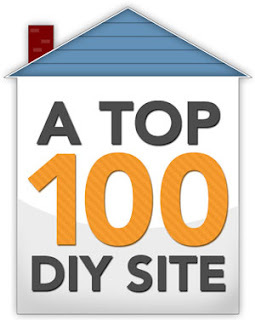 And, do the gilded letters stand for "do-it-yourself," I wonder? Love the abundance of textures. I'm not in love with the message of poor maintenance that distressed surfaces give. A little distressing is fine in furnishings for home staging, but too much says the home's been neglected, and that's the last impression you want to give buyers. Unless you are marketing your home exclusively to women (which would be foolish, impossible, and illegal), this sort of tabletop tableau is a staging misstep. There is so much detail here that a buyer's going to be distracted. 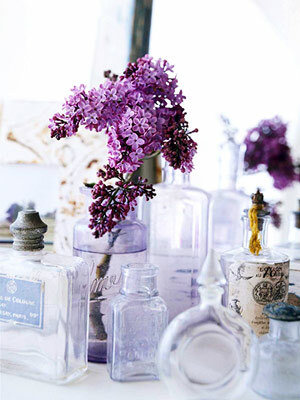 It's clutter, no matter how artsy the arrangement. Besides, these lovely vintage bottles could easily pocketed by someone on a house tour, someone who sells on eBay, or someone who just had to have one! Here we're looking at pretty. There are lessons to be learned. Old paneling has a fresh coat of white paint. The hutch, in a different shade of white, shows just enough distressing to be interesting. 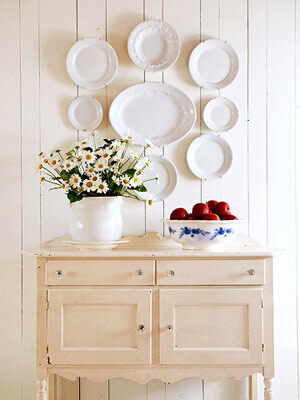 The wall arrangement demonstrates a sweet and cheap way to bring the eye up. There are no harsh colors, no clutter, no confusion. What could be fresher than a big ole jug of daisies? And you know how I feel about blue and white! Love it. In this room, the gorgeous, hardwood floor -- which buyers love -- is the focal point and everything else revolves around it, literally. Leggy furniture shows if off, and even the tablecloth points to it. Both the corner cupboard and the chandelier politely round out the room but don't call attention to themselves. Buyers are bound to notice and appreciate all the beautiful trimwork -- windows, doors, baseboard, crown molding. This staging is a perfect example of making an older home look refreshingly youthful. Nicely done. Re-purposing done right. 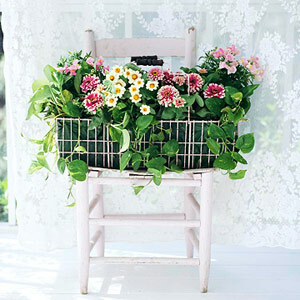 An old basket and an old chair bring some life to an otherwise too-white window area. Staging should shun skimpiness. No one's skimping here, because both the amount of flowers and the size of the wire basket are generous. The curtain is lacy without being old fashioned, and the chair is only lightly distressed. Five stars! The colors are muted and lovable. The pillows are big and in pairs. Nothing obstructs the view of outdoors. The color scheme is benign. The slipcovered furniture is informal and comfortable. 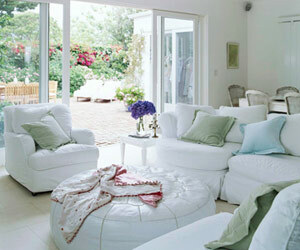 I would lose the throw blanket for a home showing but I want that white leather ottoman! Staging grade: A-plus! I chose this photo because there's one more element of shabby chic that works for staging, the choice of paintings that please. The typical artwork adorning walls in shabby chic homes is old oil paintings of roses in gilded or painted frames. I liked the casualness of these two unframed, well-sized, floral pictures. Stagers do well with florals. To review, say yes to soft colors, slightly distressed furniture, comfortable upholstered or slipcovered pieces, natural textures, re-purposing with a purpose, and refined elegance in moderation. The shabby chic decorating style that took off this country in the late 1980s after Rachael Ashwell popularized it in California, has plenty of fans. Despite the fact that it originated in England among the well-heeled as a way of saying, "I have so much money and good taste that I can do as I please, thank you, and leave my faded damasks, paint-chipped armoirs, ratty upholstery, torn wallpaper, beat-up tables, and sentimental paintings as they are," the effect doesn't necessarily look all that wealthy and tasteful on this side of the Atlantic. For more ways to dress your home for the real estate market, and facts about which decor styles work and which don't, check out my $4.99 eBook, DIY Home Staging Tips to Sell Your Home Fast and for Top Dollar.